during the Monster Energy NASCAR Cup Series Food City 500 at Bristol Motor Speedway on April 7, 2019 in Bristol, Tennessee. The win of the Food City 500 Monster Energy NASCAR Cup Series race at Bristol (Tenn.) Motor Speedway came down to a brotherly battle between Kyle and Kurt Busch. The younger brother, Kyle Busch, was able to hold off his older brother in the closing laps to claim his eighth-career Cup Series win at Bristol and his third series win of 2019, eight races into the season. Kurt Busch, a six-time winner at Bristol finished second after closely battling his little brother for the lead and eventual win after the two drivers stayed out during the 11th and final caution of the race to restart on the front row with 14 laps to go in the 500-lap race. 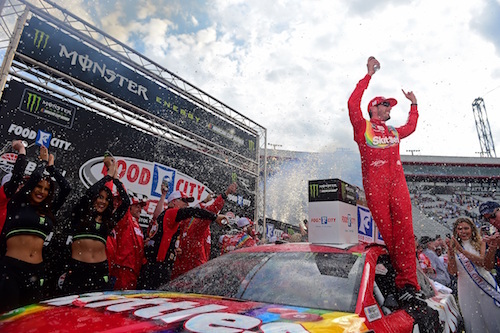 The latest Busch win extends a string of Busch family wins at BMS to three, as Kyle Busch won last year’s Food City 500, and Kurt Busch won at Bristol last August. The win Sunday also continues the Joe Gibbs Racing/Team Penske stranglehold on victory lane, as those are the only two teams with wins, so far, in 2019, five of those credited to JGR. The Penske duo of Joey Logano and Ryan Blaney finished third and fourth, and Kyle Busch’s JGR teammate Hamlin overcame a pit-road speeding penalty in the final 100 laps of the race to round out the top-five. The third Penske driver, Brad Keselowski, was in the top-five late in the race, too, but he was black-flagged on the final restart for not following a NASCAR directive. 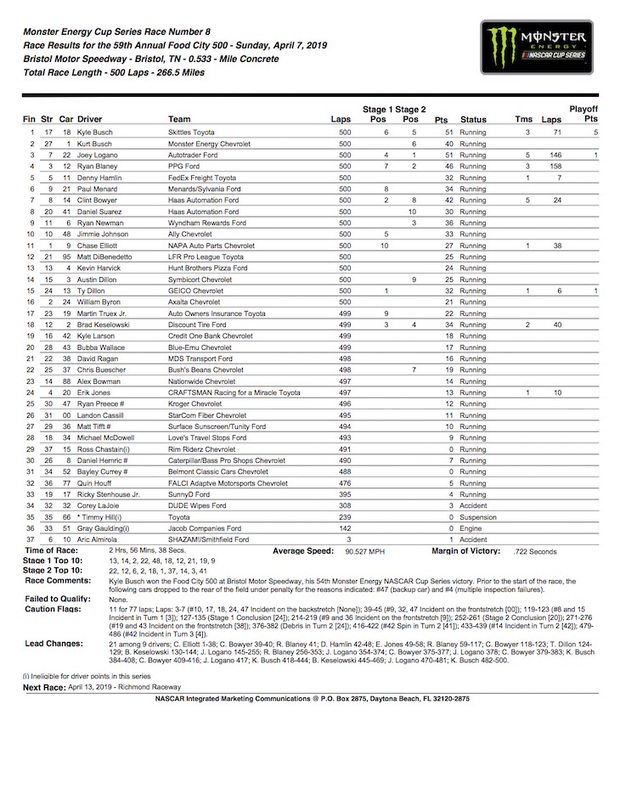 Ty Dillon and Joey Logano were stage winners in the first 250 laps, with Dillon winning the first 125-lap stage after taking the race lead from Clint Bowyer on the final lap of the stage. They were the top-two after staying out during a caution just before the stage ended. Chase Elliott started on the pole and led the first 38 laps of the race before spinning while trying to avoid the spinning nearly-lapped car of Ryan Preece. Elliott struggles continued in the form of a loss of power steering. He fell off the lead lap in the second stage, but got back on the lead lap and up to the top-five in the running order before an incident that also involved Clint Bowyer with just under 70 laps remaining. When Elliott’s troubles began, so did the dominance of Team Penske. Bowyer also ran among the Penske drivers throughout the remainder of the opening stage. Keselowski and Logano were up front for the start of the second stage, staying out between the first two stages after pitting during the caution a few laps earlier. Twenty-laps into the second stage, Logano took the lead from his teammate and led throughout the remainder of the stage. By the end of the second stage, though, Keselowski was replaced by the other Penske teammate, Blaney, in the second position to Logano. The Penske trio would’ve started the third stage, which consisted of the entire second half of the race, in the top-three positions, but Keselowski made an extra stop to tighten lug nuts while Blaney and Logano lined up on the front row. Both Blaney and Logano led laps in the second half of the race before the eventual race-winning Busch took his first lead after a lap-372 debris caution. Bowyer and Keselowski also led additional laps before Busch took his final lead during the final caution. Finishing sixth through 10th were Paul Menard, Bowyer, Daniel Suarez, Ryan Newman and Jimmie Johnson. Kevin Harvick finished 13th after being as far back as four laps down at one point in the race. After his car failed pre-race inspection three times, he started in the back in served a pass-through penalty. But a caution for an incident that involved Aric Almirola, Ricky Stenhouse Jr. and Kyle Busch on lap two resulted in an early-race caution, minimizing Harvick’s penalty. Harvick went down additional laps after an unscheduled stop for a loose wheel. He got up to a single lap down but a scrape with the retaining wall on lap 372 put him two laps down, again. He got back on the lead lap during the final caution of the race.